Mark Brittingham joined the Law School faculty in 2007 as Visiting Assistant Professor. A 1982 graduate of the SIU School of Law, he comes to the law school from SIU’s Office of the General Counsel where he spent five years as the University's chief labor lawyer and, in 2004, its Interim General Counsel. Prior to joining the University, Professor Brittingham spent twenty years in private practice in St. Louis. His private practice focused on business, employment, and environmental litigation, and on general business counseling. He has handled to conclusion antitrust, securities fraud, contract, employment and education discrimination, NEPA, and shareholder lawsuits. He also has negotiated collective bargaining agreements and handled many labor grievances and unfair labor practice charges, in both the public and private sectors. Finally, Professor Brittingham has substantial experience with the law of public entities. 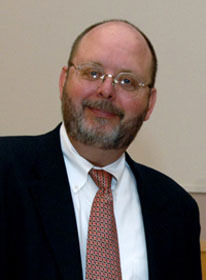 In addition to representing public school districts and fire protection districts, he served as vice-president and director of the St. Louis Development Corporation; director and chairman of the Land Clearance for Redevelopment Authority; and director of the Planned Industrial Expansion Authority—the principal public redevelopment agencies of the City of St. Louis. During his terms of service, these agencies constructed the Edward D. Jones Dome, the new Kiel Auditorium (now the Scott Trade Center), and St. Louis Marketplace, Missouri’s first tax increment financing project. Professor Brittingham also served two terms as alderman of Eureka, Missouri. He continues to serve on the Advisory Committee to the Illinois Educational Labor Relations Board and on the Board of Directors of the Shawnee Healthcare System, the largest provider of healthcare to the indigent in southern Illinois. Professor Brittingham's wife Kathleen Pine, also a 1982 graduate of the School of Law, is a long-time member of the St. Louis law firm Sandberg, Phoenix and von Gontard, where she represents doctors, hospitals, and other health care providers in professional liability lawsuits.